An excerpt from Andrew Cornell's excellent Unruly Equality: US Anarchism in the 20th Century. This article is excerpted from Unruly Equality: US Anarchism in the 20th Century (Berkeley: University of California Press, 2016). During the presidential campaign of 1931, the patrician Democrat Franklin Delano Roosevelt instilled hope in a deeply shaken electorate by claiming "the forgotten man at the bottom of the economic pyramid" deserved a "new deal." During his famous first hundred days in office, Roosevelt proposed a flurry of new programs and policy changes aimed at reversing the downward spiral of the domestic economy, then already in its third year. US anarchists approached the New Deal with their typical skepticism toward government initiatives heightened by suspicions stemming from the manipulative ways in which Mussolini and Hitler had recently ascended to power. In the April 1933 issue of the insurrectionary anarchist newspaper Man!, editor Marcus Graham dubbed FDR's approach a "new hoax" and reminded readers that they could expect nothing from government but "deceit and treachery." He took particular umbrage with the Civilian Conservation Corps, the first experiment with a work-relief program, in which young men would be paid a modest wage to develop natural resources under the auspices of the War Department. "What this dastardly scheme really implies isn't hard to guess," Graham wrote. "It will be used for a two-fold purpose: first, to further lower the workers' wage scale; second to have a standing army ready to drown in blood any uprising that appears now so imminent." By August, Graham had concluded that the New Deal was a plot to introduce "American Fascism" under the guise of assisting the unemployed. In early articles on the subject, contributors to the anarcho-syndicalist journal Vanguard focused more attention on Roosevelt's National Industrial Recovery Act (NIRA) but arrived at similarly pessimistic conclusions. The act suspended antitrust laws and created boards to establish "industrial codes" with the intention of raising commodity prices by limiting competition. It also affirmed the right to organize, called for labor to be represented on its industrial boards, and set a minimum wage and maximum hours for participating corporations. Writing in May 1933, Mark Schmidt critiqued the "rigging and freezing up of prices" that the NIRA's industrial codes attempted, and predicted that the NIRA would dangerously increase the government's role in labor conflicts. "Democracy will become attenuated to the vanishing point, the powerful trusts merging with bureaucratic State apparatus, the workers' organizations deprived of any right to strike and act independently, 'coordinated' with the State…. This is the trend toward Fascism." Melchior Steele, a contributor to Man!, likewise believed that with the government acting as "a party to contracts," strikes would amount to "rebellion against the government," further disinclining patriotic workers from taking part. In actuality, a quite different scenario played out. Firms stridently resisted the NIRA's prolabor planks, refusing to abide by them and challenging their constitutionality in court. The president of the United Mine Workers, John L. Lewis, meanwhile publicly explained the new policy as a mandate from the president for workers to join unions as a means of combating the Depression. They responded enthusiastically, joining unions by the hundreds of thousands. The largest strike wave since the end of the Red Scare broke out the next year, as workers throughout the country fought to enact and defend via direct action the new labor rights that Congress had declared but had done little to enforce. As Staughton Lynd and other historians have demonstrated, the labor upsurge of the early 1930s was driven by local unions that mobilized entire communities, frequently bridging racial and gender divides. Following the lead of former Wobblies and other radicals, many adopted democratic decision-making procedures and militant tactics to ward off strikebreaking police and replacement workers. Yet self-identified anarchists do not appear to have played significant roles. Having grown disheartened by the labor movement and distanced from less radical workers during the 1920s, anarchists often viewed the new unionism with jaundiced eyes. During the summer of 1934, to cite one example, communist longshoremen in California organized some 130,000 San Franciscans to halt work for four days in support of striking dockworkers. Marcus Graham dismissed the event's significance, telling readers of Man!, "There was no General Strike in San Francisco worthy of the name." Though Graham lauded the rank-and-file workers who had walked off the job, they had, to his mind, been betrayed in a predictable fashion by "despicable and treasonous" union spokesmen who had curtailed the strike. He could only hope the workers had learned their lesson: "never again to entrust their struggles in the hands of leaders." Though the critique of overly conciliatory representatives had merits, the pessimistic and critical commentary issued by anarchists in the 1930s won them few new blue-collar supporters, given that they offered no organizational alternative. Although the Supreme Court eventually ruled that the NIRA's industrial boards were an unconstitutional interference with private business, the 1935 National Labor Relations Act bolstered the standing of unions. It declared collective bargaining not only legal but also a social good, and it established a government-monitored procedure by which a majority vote established a union as the sole representative of the entire workforce of a facility. (New Deal politicians believed government backing would make it easier for workers to organize and command wage hikes. This would increase their purchasing power, redistributing wealth and reducing the threat of overproduction that had catalyzed the crisis in the first place.) Bolstered by the new law, but faced with continuing employer recalcitrance, unionists launched major organizing drives among semiskilled workers in the steel, mining, automobile, and other industries that had become the centerpiece of the American economy. Much of this organizing occurred under the auspices of the Congress of Industrial Organizations (CIO), a new umbrella organization that broke away from the AFL in 1935. Like the IWW, the new CIO unions sought to organize industrially -- uniting every worker in a given field of production, regardless of skill level and race. Unlike with the IWW, the abolition of capitalism was not a goal, and internal union democracy was not a priority. Indeed, John L. Lewis and other CIO leaders "preferred to act as labor generals who led their troops in battle, not as temporarily elected representatives who reflected the wishes of the ranks." To the publishers of Vanguard, the CIO was barely distinguishable from the AFL, an object of anarchist disdain since 1886. "A new unionism will not spring up as a result of those puny efforts," an October 1936 editorial assured readers. "The militancy of the great mass of unorganized workers will be stifled from the very beginning and whatever may be accomplished ... will be distorted by the monstrous centralization of power in the hands of an irresponsible bureaucracy." The CIO did quickly move to consolidate many of the local unions formed in the early 1930s, and Vanguard was perceptive in anticipating the autocratic grip Lewis would exercise over the organization. Yet the group misjudged the potential for a new, militant unionism to arise in the 1930s. The next years saw the invention of the mass sit-down strike in Akron, Ohio, and Flint, Michigan. Union membership grew by 5 million over the course of the decade, raising the percentage of the organized workforce from 7.5 to 19.2. Moreover, the CIO actively organized African American industrial workers and built multiracial locals with the intent of breaking the color line that still characterized many AFL unions. In the wake of these advances, Vanguard published more nuanced considerations of the emerging social order. Contributor Joseph Zack argued in 1937 that the United States was becoming a "State Capitalist" system. Responding to the crisis features of traditional capitalism evidenced by the Depression, the government would henceforth take on "regulation of wages, prices, working hours, of 'social security' legislation and monetary manipulation" -- in short, "the superstructural manipulation of capitalism for the purpose of defending its base." In Zack's view, the farsighted capitalists who favored this method of stabilizing the system could only overcome the resistance of traditionalist elites through the mobilization of working people. Roosevelt embraced the CIO to this end. In turn, Zack felt, "the aim of the C.I.O. leaders is to get an expanded, well implemented and regimented N.R.A. [National Recovery Act], in the operation of which the new union bureaucracy will be the important and well paid servants of the new capitalism." Zack lauded the sit-down strike as a powerful new weapon developed by militant rank-and-filers, one that gave them greater leverage not only against their employers but also vis-à-vis the union bureaucracy. The sit-down strike, he concluded, "promises to be as much of a fighting instrument on the part of labor as the system of state capitalism is for the capitalist." Vanguard's developing perspective anticipated many points later elaborated by C. Wright Mills, C.L.R. James, and other influential critics of mid-twentieth century unionism. Yet it may also have reinforced the anarchists' sense of paralysis. While hundreds of communists and socialists took up organizing responsibilities in the new CIO unions during the 1930s and 1940s, attempting to radicalize them in the process, anarchists largely continued to sit on the sidelines. What, then, did anarchists suggest that those impoverished by the Depression do? Here the factions split in predictable ways. By late 1935, the Vanguard Group's Abe Bluestein could acknowledge that "Roosevelt's New Deal has lifted this country from the low depths of March, 1933." He felt its effects personally, as his wife, Selma, a painter, had taken a position with the Works Progress Administration. Nonetheless, Bluestein issued a pamphlet arguing that too many people remained unemployed, while those working for New Deal agencies remained scandalously underpaid. 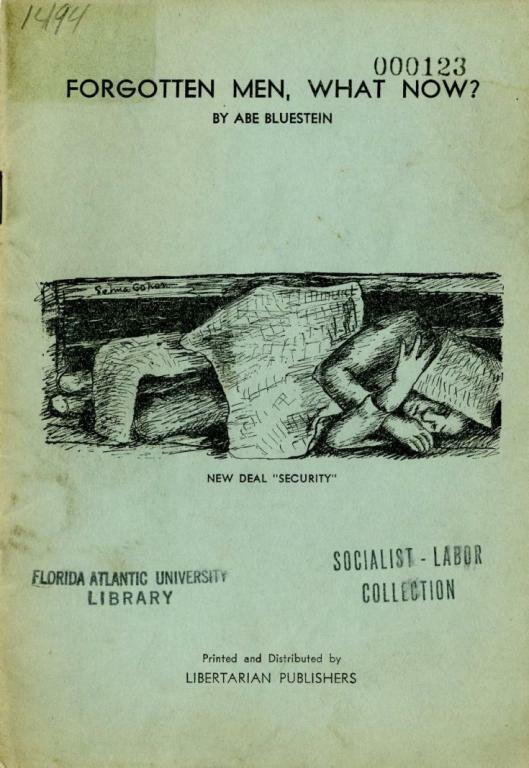 Reiterating that a complete solution required revolution, Bluestein nevertheless proposed a program to fight "for some measure of security from starvation." First, workers should demand "prevailing wages" for the unemployed and publicly employed, paid for by "the wealthy." Next, they needed to "get back into industry" by fighting for shorter hours with no reduction of pay, as a means to spread out the work. Winning these reforms, he believed, required the courage to break the law: "Let the unemployed show a little more respect for their persons and a lot less for private property, and the government and the wealthy will also begin to fear and respect their strength." With little fanfare, then, a cofounder of the Vanguard Group acknowledged that despite a half decade of Depression, the final break with capitalism wasn't imminent and the federal government now represented a legitimate target from which anarchists might wring concessions, assuming they did so using disruptive direct-action tactics rather than elections and lobbying. To Marcus Graham, who anticipated the arguments of late-twentieth century anarcho-primitivists, however, "getting back into industry" was precisely the wrong approach. In late 1934, he wrote, "As it appears to me, the gravest of danger for mankind lies in the continued immense growth of industrialization of life to the point where the individual loses more and more of his significance as a self-reliant, self-creative and self-ingenuitive [sic] human being." Moreover, Graham believed the Depression was rooted in overproduction occasioned by industry's adoption of new technologies. With other countries following suit, the United States could not rely on expanded foreign markets to pull it out of the slump. War, he presciently asserted, would be the only way to eliminate oversupply and reverse the trend. For all of these reasons, Graham insisted, "the decentralization of every centralized power and activity is the only safe assurance for the building up of a true and free society." To that end, in 1932 he urged an Austin, Texas, audience not to wait for federal assistance but to seize uncultivated land with the aim of supporting themselves. In Memphis, he was even more direct: "Abandon the cities; leave them as monuments to the folly of man." It is impossible to know how many people -- if any -- took this advice. Any who did would have been forced to learn the rudiments of homesteading during one of the most severe droughts in the nation's history -- one that sent thousands of "Okies" and other dust bowl residents fleeing to California. Between the 1930s and the 1950s, anarchists overwhelmingly viewed the New Deal, and more generally the rise of the Keynesian welfare state, as a sophisticated form of co-optation that represented a severe setback for the labor movement and, hence, for social anarchism. This interpretation was essentially built into their bedrock belief that political states can do no good for ordinary people. Worries about the depoliticizing potential of state income supports were not unwarranted. Yet this perspective naturalized the outcomes of Keynesianism in two troubling respects. First, it discounted the pressure labor and radical movements had exerted on elites in order to win unemployment insurance, overtime pay, and other gains, reinforcing gloomy assessments of the midcentury labor movement. Thirty years later, however, the Diggers, Murray Bookchin, and other anarchists claimed that new utopian possibilities arose from the unprecedented growth of first-world economies. They assumed this "postscarcity" condition would continue indefinitely, as it appeared to be an outgrowth of technological developments as capitalism ran its course, rather than (at least partly) a politically imposed division of wealth. For this reason, few anarchists saw the gains won by workers in the 1930s as vulnerable, or even as "their" gains to defend when the business class launched a concerted attack against them in the 1970s. Like many other progressive and radical forces, they were caught off guard by the onset of neoliberalism. Andrew Cornell is an educator and organizer currently serving as visiting assistant professor of American studies at Williams College. He is the author of Unruly Equality: U.S. Anarchism in the 20th Century (University of California Press, 2016) and Oppose and Propose! Lessons from Movement for a New Society (AK Press, 2011).